Though I’m not a big fan of these, I do pick up a pack occasionally to make this thoran . All of the flavors blend very well to make a pretty decent dish. Sauté the onions, add the garlic and mushrooms and cook on medium to high heat till mushrooms are cooked. Add the sambar and coriander powders and mix well. Cook for a minute or two. Add the grated coconut. Mix. Serve hot. mushrooms in south indian style!!! i got to try it. Very innovative of you! Thorans are really a quick and tasty way to use up any veggie, right? BTW, I do give mushrooms a quick rinse (never mind what the experts say). I wash them *right* before cooking, though. I think the whole damp wiping is to keep the mushrooms from absorbing water and getting soggy, but this is not so much of an issue if they are cooked right away after rinsing. I make thoran with egg and mushroom or with coconut. Fresh mushrooms really tastes great. Nice pic..TBC. wow that curry looks yummy and spicy...i love mushrooms! I love all kinds of Thoran, looks yummy tbc. I lve mushrooms and mu hubby too. I have never done a thoran with it. This looks so good! I've never attempted a thoran with mushrooms before. Is this made with the white buttom mushrooms? The most awesome thoran! I have to try this soon, TBC! The aroma must have been heavenly! i can imagine how good mushrooms taste with coconut, i once tried eggplant and mushroom combo with coconut. Looks Yum Tbc! Great recipe. Yummy! Looks lovely as usual! Great pic. mushroom thoran?? wow :D lovely idea! why didnt I think of that?! 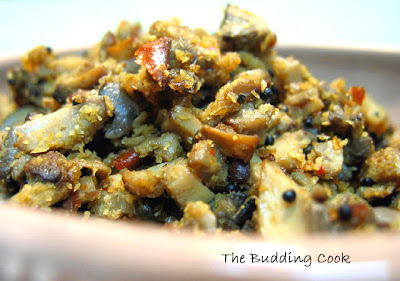 Mushroom thoran Looks so delish!....Nice recipe...Love it..
Wow..Thats new for me...A nice way to prepare Mushrooms!! I can't possibly imagine ignoring mushrooms! I go through fits of withdrawal if I go a week without a dish that heavily features them. I would be sure to love this. I like the addition of coconut. Not sure I've tried that yet. Thanks for this! thoran is wonderful...try varutharacha curry too.mushrooms taste good like that too. I always just rinse them under a cold tap. How else do you get the mud off them? This thoran recipe is lovely! I must use it to finish the jars of homemade sambhar powder I have sitting around. Thats looks yummy! The picture is to tempting! I love mushrooms, and this recipe is new to me, i do not make dishes like these in my house, but i'm gonna try this Thnx for sharing! Nupur- I don't know about that. I make a thoran out of pretty much anything! ;-) That's the first(and in most cases the only) thing I can think of! Asha- yeah, my sentiments exactly. :-)I do the same too. Laavanya- thanks:-) Yes, button mushrooms. I guess one could also use other kinds. Musical- oh no! brinjal and mushrooms! my 2 least fav veggies. Lisa- Oh I can ignore them forever! I would never even miss 'em. :) Do let me know how you like it if you do make it. This is a very common preparartion in South India. Mallugirl- that does sound good! I might not even taste the mushrooms in it!. Mona- thank you:-) Another mushroom lover! I've never been satisfied just to wipe a mushroom off, either; I always soak them briefly in very cold water then power wash all the compost debris off them with the sink hose. After that they get quickly cooked. No big. This looks great, TBC. I recently made a mushroom ambat that I was very happy with. Susan- I've never tried an ambat-mushroom or otherwise- before! Meera- thank you:-)... and u are welcome. I added some other veggies, but it was essentially mushrooms; in fact, the original recipe I adapted it from was mushroom based.